Professional Services firm honored a third consecutive year for setting the standard in leadership, benefits, innovation and happy employees in Washington state. BELLEVUE, WASH. – June 24, 2016 – For a third consecutive year, Altriva Solutions has been honored as one of "Washington's 100 Best Companies to Work For" 2016 as announced by Seattle Business magazine at an awards dinner on June 24, 2016, at the Washington State Convention Center in Seattle. Altriva, a professional services firm, ranked 16 in the small business category which consists of companies with 10-40 employees. Altriva joins 23 other companies to receive this award three years in a row. Winners are selected solely by employees through an extensive nomination and employee survey process, and not by Seattle Business magazine or its advertisers. A third-party research firm analyzes thousands of surveys and determines the company's score based on 10 categories which include executive leadership and corporate culture. For 27 years Seattle Business magazine has honored Washington companies that are setting the standard for leadership, strong benefits, best work environment, innovative training programs, happiest employees and more. Altriva Principal, Justin Mathena said, “we couldn’t have received this award without all of dedicated team members. Our company's greatest asset is our employees, so the fact that our employees love to work for Altriva is very rewarding, and shows the value of our firm and its core principles." Altriva is a professional services firm that partners with clients to achieve strategic business objectives by applying extensive experience and expertise in delivering integrated, customer-centric solutions. Altriva is founded on principles of dedication, professionalism, and a commitment to excellence that translate into value to the customer on every engagement. We are recognized industry experts in Customer Engagement solutions (specializing in Microsoft Dynamics CRM), Application Development, and Integration. Learn more at http://www.altriva.com/. To learn more information, or to arrange an interview with Altriva please contact Caitlin Stork at cstork@altriva.com or (425) 602-9546 x112. 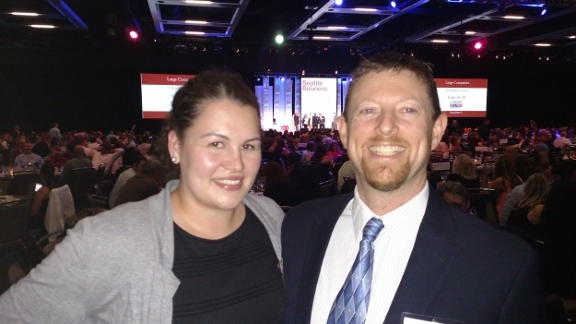 Altriva employees, Lia Thompson and Hoss Hostetler, at the awards ceremony. Altriva's award and the official award's logo.